From AMI's press release: "Proven stability, modularity and ease of porting of APTIO® are not compromised and they conform to UEFI and PIWG specifications" Wow! Since there are no PIWG specifications yet (the latest are in draft), I guess that's easy to accomplish. And this is the first time I've seen them claim UEFI 2.0 compliance (since that's the only spec released so far). I'm not even sure EDK 2.0 (Intel's tianocore version) can claim that yet. As represented here: http://www.pressmethod.com/releasestorage/9378.htm, AMI is making the most of its relationship with Intel, and is starting to do training with Intel's participation, in at least Boston and Santa Clara. They claim to have done one already in Tokyo. This is important for Intel because Intel switched to use Aptio on their mobile reference platforms, but very few of their customers use the AMI code base (AMI having not traditionally been strong in this market). Tokyo is a prime example where nearly all of the platform vendors use Phoenix currently. 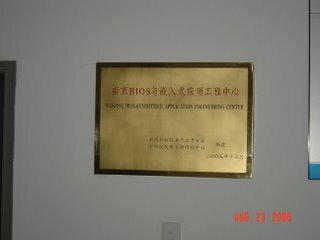 I actually went to visit one of the companies which is working on the project: Nanjing Byosoft. This is the one headed by ex-Phoenix employee Kangkang Shen. I went there on the last day of my trip to China. Their focus seems to be on the embedded space and they are in some sort of in-China competition to see who will do the project with the government. They are in a small building in the research park near where Phoenix had its building before. We also toured the sight of their new building, a 10-story building due to be finished next year, all dedicated to BIOS and embedded systems. The other three buildings in that complex are for animaton and game programming.